The Disunity of American Culture describes culture now, when different forces are influencing it than in the past, altering it to near incomprehensibility. Identity issues have an effect on culture and politics; more influential is the question of what support the state is obligated to provide the individual. John C. Caiazza seeks to explain how this situation came to be.He begins with an explanation of the origins of Protestantism in America. Caiazza describes how the American religion has declined and the recent responses the decline has provoked. 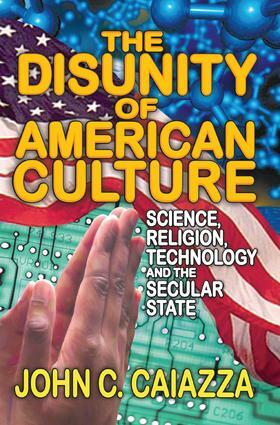 Caiazza follows with an analysis of science as it presently exists in American culture. The work of three scientists prominent in their respective fields—Steven Weinberg in physics, E. O. Wilson in biology, and Stanley Milgram in psychology—are examined with respect to how their work has influenced culture.The author examines the failure of America's school of philosophy, pragmatism, to explain the relationship between religion, science, and general culture, even though its founders, Charles S. Peirce and William James, made serious efforts to do so. He concludes by making the case that there is a contradiction between scientific reason and the claim of state power. Caiazza argues that cultural disharmony will guarantee that the secular state never achieves the dominance over culture and political life it desires.